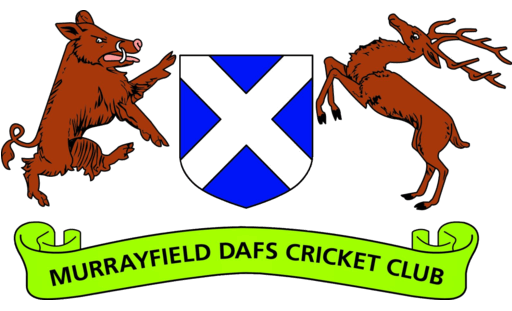 Murrayfield DAFS (20) : 187-9 in 50 overs. Edinburgh Accies (6) : 121 all out in 41.5 overs. Ones maintain their perfect home record with a comfortable win against Edinburgh Accies. On a brilliant day for cricket the Ones, bolstered by the return of skipper Hawkins were looking to maintain their 100% home record at Roseburn. Luke Hayes seems to have handed over his knack of losing tosses along with the Ones captaincy with the Hawkman losing the toss for the 2nd time in the two games he has captained. MDAFS asked to bat first. Maggy and Finn opening, with both batsmen relatively unperturbed by the opening bowlers. A 33 run opening stand was broken in the 12th over when a straight drive from Maggy brushed the bowler’s fingers and hit the stumps finding Finn backing up a bit too far and just out of his ground. Unfortunate dismissal just when both batsmen were looking to up the scoring as well. Alex was next in and next out for 1 as a result of a lose shot outside off, nicking behind to the keeper. At the other end Maggy was finding his range and quickly accelerating making the most of his second chance. Lewis in next, high on confidence after a very responsible 61 in the previous game. Maggy next out as he goes fishing outside off for a well made 41 in the 24th over with the score on 63. Batman walked in next and along with Lewis put on 41 runs in 12 overs. Some good lusty hits from Lewis ensuring we do not stagnate. Batman out next; another caught behind. MDAFS score 83 runs in the next 14 overs the highlight being a blistering 43 from Sam Fergusson (usual strike rate for Sam) with good support from Ash and Gav. All 3 batsmen scoring at a good rate and putting the pressure on the opposition. MDAFS finish on 187 for 9 of their 50. Great batting from Maggy and Lewis at the top and Sam added the finishing touches. Par total was the general consensus given how dry it was. After a brilliant tea from our in-house baker / opening bowler Nadeem Anjum, Gav and Nads opened up. Gav having Banksy Jnr caught behind in his 2nd over and Nadeem joining him by having their number 3 caught behind in the 6th over. Excellent bowling by the two with no further success as Cosh and Thornton batted out the opening spell. The latter leading a charmed life whilst the former showed excellent application and unleashed powerful shots whenever the bowlers drifted towards his pads. Gav’s first spell figures were 6-1-12-1. Nadeem bowled his ten on the trot showing excellent control and not letting the opposition get away, finishing with 10-4-16-1. Yelland and Sam were bowlers 3 and 4 with the former not having a great day in the office in his 5 over spell and the latter was economical in his 3 overs before the skipper turned to the spin from Ash and whatever Batman bowls (no description available). Finn taking an excellent catch to finally break the 64 run partnership in the 29th over that was beginning to threaten. Yelly then strikes with a direct hit runout to get rid of Farooq for nought. Batman accounts for another in the 33rd over. Double strike in the 35th over with Batman getting rid of the dangerous Cosh; taken by Yelly at square leg and Yelly contributing to another run out. MDAFS well and truly on top. Batman strikes again in the 37th, Nadeem taking a catch at gully. Ash, who was expensive to start with next to get into wickets column with Sam the catcher. Gav returns to finish off the tail and seal a comfortable win by 66 runs. the day was the partnerships while batting and our fielding. Next game is Away to last year’s champions Edinburgh CC. 3s Make It A Hat-trick!